Oppo, my current dashcam’s mount broke and its time to replace with a new camera. Any recommendations? Any other oppos that have a later gen Subaru Outback have issues with the driver seat squeaking? Mine started about a month ago and has gotten progressively worse. Like any sort of movement of me or the car will cause it to squeak. The car only has 7700 miles on it. My first snowfall with the Outback and of course I had to go out and have some fun with it. I tried things that my Dart would have certainly struggled with or would have gotten stuck but this handled everything like a champ. Also, the Bridgestone Dueler tires were just fine for this southern snowfall. Im at the Portland GP this weekend and the Global MX-5 Cup was one of the support races. NOTE: Sorry for the crappy pictures. It has rained about every day since I bought the car, and I haven’t been able to give it its first wash and wax to then take decent pictures. It has been a while since I’ve been around. But I come with a question. 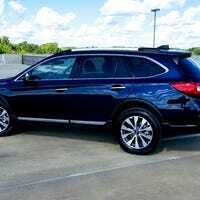 What are the thoughts of the current gen Subaru Outback. I’m considering a 3.6R Limited or Touring model. Lady pulls out on to a road with a 45 mph speed limit absolutely crawling, decides she wants to get into the left turn lanes, and instead of just making the move, felt stopping was the best option.........Yes I was pissed. Here Oppo, have a dashcam video. Please, please, please remember to use parking brakes in conjunction with your car being in park (or in gear for those who drive standard). I received this email from the property managers of the office building I work in. This happened about 20 min from me yesterday...... just watch.... Reposted for those that would like to view stupidity. 3Hr 10Min Left and #38 LMP2 LEADS OVERALL! #1 Porsche had about 12 laps on the field and suddenly died on track with about 3:40 left in the race. I was starting to doze off but I’m wide awake now! LMP2 cars have been causing issues left an right all day. Most notably taking out the Risi Ferrari in GTE Pro and now the #9 Toyota. The 24 hours of Le Mans is upon us. Green Flag is roughly 9am eastern time. How is everyone watching the race? Is anyone trying to go the full distance (I normally stay up for the full race)? Predictions?